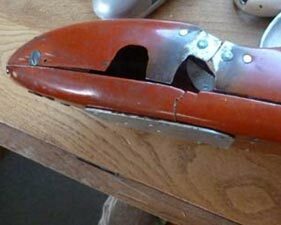 Always worth a look in the attic? Some months ago, we pondered on the differing ways items for our Pitboxes could appear. The most intriguing of these is where there was no prior knowledge regarding the items or indeed that they were in existence. Such was the case with the cars and other items belonging to the late Bernard Manley that came to our attention some years ago. Following up the history of these cars proved a thoroughly enjoyable and illuminating process for us, and seemingly quite profitable for the family when they were offered on eBay. That it might ever happen again was something of a vain hope and seemed most unlikely, until December 2014 that is. 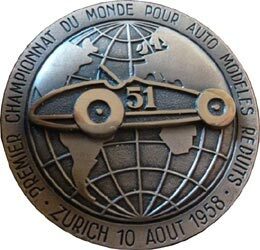 In 2013 at the World Tethered Car Championships in Basel, we were lucky enough to meet Roland Salomon, who had been a multiple champion in the late 1950s. Amongst all the material he showed us was a series of photos albums from that era, which included numerous photos of the British competitors who had attended meetings in Europe in 1957-58-59. 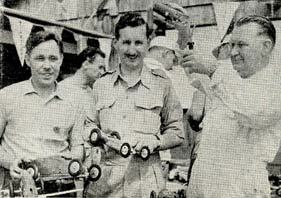 The likes of Stan Drayson, Jack Cooke and Ken Procter were well known both in England and abroad. The third member of the team photographed at Zurich and Basel in 1958, Les Williams (sic), was unknown to us so we were unable to pass any more information to Roland. The matter was given no more thought until an email arrived revealing that all his cars, spares, equipment, trophies and other memorabilia had been discovered in his attic some while after his death at the grand age of 95. This was potentially one of the most exciting finds in recent tethered car history, but we did not appreciate the full extent until we had looked at the photographs of the collection. An acquaintance of the family tasked with sorting all the steam models that Les had acquired had discovered this treasure trove, photographed it all, and in turn contacted us. To describe it as such is something of an understatement as nothing similar from this period has come to light, although two of Ken Procter’s Oliver engined cars did turn up in the US, but why was so little known about Les? Firstly there was some confusion about his name, as the results from Switzerland showed him as Les Williams, whilst his surname was actually Williamson. Secondly, he does not appear to have started racing until well into the 1950s, when the tethered car scene was already in decline and only Model Maker was reporting on car events, and even then sporadically, the other two specialist magazines having already ceased publication. Les Williamson was based in Leicestershire, close to both the Leicester Minicar Club, and just 30 miles from the Nottingham Club track at Bassingfield. During his short career he raced for both of these clubs as well as Blackpool. The first mention of him in a race report was in 1952 at Edmonton where he ran a 10cc car and recorded 106mph. In 1953 at Cleethorpes he won the 2.5cc class as an A grade driver. Oddly, the next mention was when he headed the 2.5cc B grade list at Sunderland and consequently was promoted back to A grade. 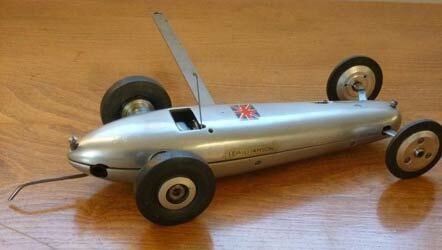 In 1955 he won a MCA Gold Star for a record run of 86.53mph in the British 5cc class at Hooton. Classes at that time were split into British and Open categories depending on the origins of the cars and engines used and gold stars were awarded for the fastest ¼ mile runs at Open or MCA meetings on standard lines other than record runs. 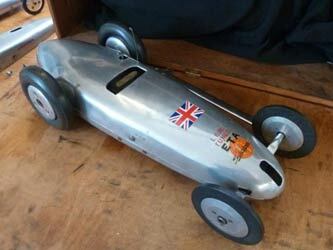 Les also won the Daily Despatch Challenge Trophy at Hooton in 1955 at 97.4mph, almost certainly with a 10cc car. 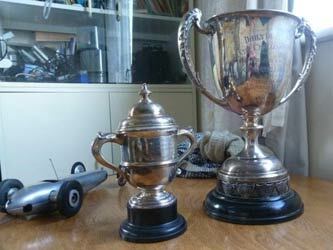 It would appear that this was the last occasion that the Hooton Club ran a race for this trophy, as it remained in Les’s possession. 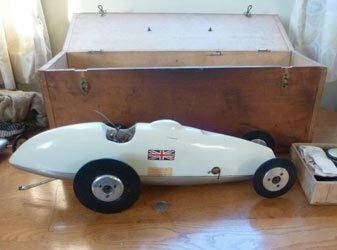 Also remaining with Les was the Lady Mary Grosvenor Trophy, another open trophy from Hooton, this time for 5cc cars, which we must assume he won in 1955. 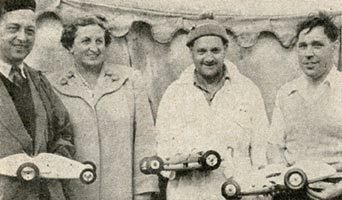 In 1956 Les was running 3 classes, competing in each at the MCA National Championships, held that year at the Blackpool track after the bad weather had forced the original event at the Woodside track two weeks previously to be abandoned. In the 2.5cc class he was 8th overall and 4th in the 5cc class, although the top B grade competitor. His best result was in the 10cc Class, where he was third overall with runs at 107 and 108mph. 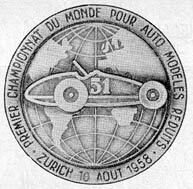 So to Switzerland in August 1958 and a double header, with the European Championships at Basel, Followed by the World Championships at Zurich one week later. At Basel, Les was the first of the British team in 2.5cc with a 7th place, 7kph behind winner Arne Zetterstrom, making this his best result of the meeting. He did not manage to record a run in the 5cc Class and was well off the pace in the 10cc Class, finishing 17th, just one place behind team-mate Jack Cooke. 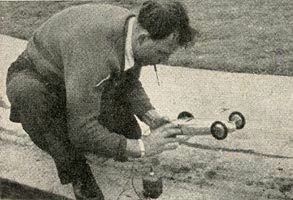 Tethered car racing in Britain was really in decline by this time and 1959 would be the last time any National competitions were run. Interest was waning all round, the MCA was in something of disarray and the London Association was considering whether to continue. Les, with his stable of competition cars and being a member of the British team had found this all very frustrating, as he explained to Peter Hill of the Retro Racing Club when he visited Souldrop in the mid 1990s. The only tracks still operating involved travelling huge distances so with no opportunity in the immediate area to run, Les seems to have turned his attention initially to slot cars and later, small steam models, which he used to display. 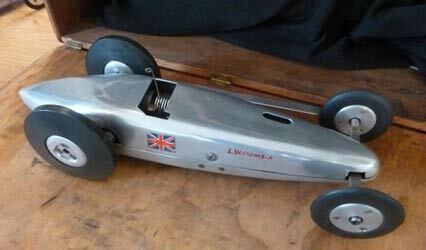 Les Williamson was born in 1918 and an engineer by trade, which explains the superb workmanship on all of his cars. 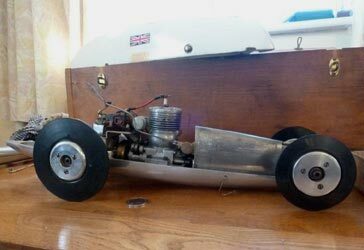 Only one of the cars is based on a commercial model, the rest are all built from scratch, three of them to the designs of British and European record holder Ian Moore of the Derby Club. This involved either machining pans from castings or panel beating them out of thick aluminium sheet, machining gearboxes, engine mounts and axles, making tanks, fuel cut-offs and ignition systems. 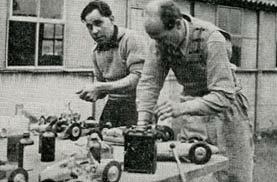 The bodies had to be built from scratch as well, either from castings for the smaller cars, hand beaten, again from aluminium sheet or built up from balsa wood. Very few commercial components were used in Les’s cars other than the motors, gears, wheels and tyres, and given that there were at least five cars, a considerable amount of time and effort must have gone into building and developing these, and not inconsiderable expense either. The two 10cc cars are both built to Ian Moore’s Number 12 design. Ian Moore held the British and European records at various stages with the original cars. His design differs from the more popular American Dooling Arrow in having a separate gearbox, rather than being direct bevel drive. One of Les’s cars has a Dooling 61 motor whilst the other has a McCoy, which was an unusual choice at the time. 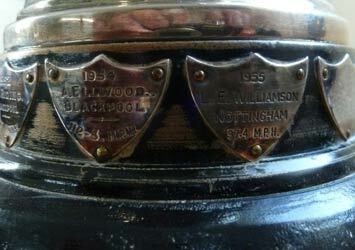 These are both based on cast aluminium pans, probably supplied either by Ian Moore or through Warren and Clarke. As far as is known only one original car to this design existed before the discovery of Les’s collection, so this is a significant find alone. Amongst the spares is a selection of tyres of various makes for each car. At present, the Dooling car has very large diameter, solid knife-edge style tyres of Swiss manufacture, probably obtained during Les' trip there in 1958. 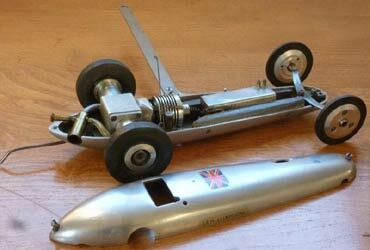 The original wheels and tyres are still in the travelling box. The McCoy version on the other hand has Grenwyn ‘flinging’ tyres that increase in diameter as the speed increases. Front wheels and tyres are from Rowell. Both cars are running on coil ignition and are fitted with Les’s own rotary fuel cut-offs. 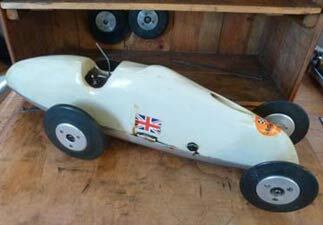 The 5cc car is another Ian Moore design, which was raced so successfully by Ian’s wife Ivy. 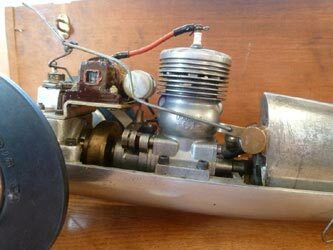 The original record-breaking car had a Dooling 29 motor, but Les’s has a British ETA 29, almost certainly due to the involvement of Ken Bedford of ETA instruments who built hundreds of these very powerful motors. Coincidently, the original car of this design that Moore built was powered by an ETA 29, although it was scrapped before being completed. This design differs entirely from the number 12s in having the motor driving through spur gears and mounted cross-wise in the chassis pan. Both the pan and body of this car had to be hand beaten from aluminium sheet, a monumental and skilled undertaking in itself. Oddly no original examples of this design were known of until two almost identical cars appeared on eBay in 2014, both built by the same person in the north of England. Something of a strange coincidence when three similar cars turn up within months of each other after something like 55 years. 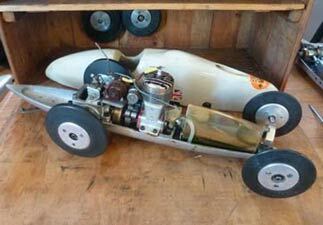 The 2.5cc cars represent the change in approach to racing in that class during the 1950s. The first car is an Oliver ‘Bottoms Up’, which, as the name suggests, uses two pans from the Tiger 2.5 car bolted together. This was first introduced by Joan Catchpole, who used it to great effect. The car is fitted with an Oliver Tiger MKII twinshaft that has been modified somewhat, especially round the exhaust area. 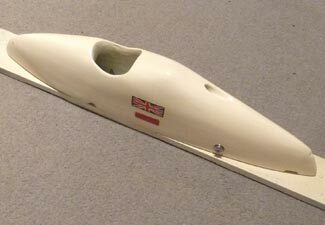 What is most evident are two large pieces of lead either side of the fuel tank to aid traction and keep the car on the track. The 2.5cc class was exceedingly competitive throughout the 1950s as engines were developed, but successful as it was, the twinshaft was hampered by the tyres needing to be ever smaller to cope with the increasing revs from the motors. In the end, the tyres would have to be unrealistically small and the move was made back to spur mounted single ended motors with step up gearing to the drive axle. This necessitated a new breed of cars, of which several were featured in plans and constructional articles, including Roland Saloman’s Sabre and Ken Procter’s Berretta Rosso and 825 Supercortemaggiore. Les’s second car is on similar lines to these based on a heavy gauge hand beaten pan, topped off with a lighter body shell, also formed from sheet. 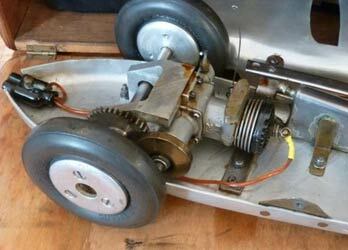 The motor appears to be a standard Oliver Tiger MK II. The rear tyres are 'Grenwyn' style as opposed to the solid Raylites on the 'Bottoms Up'. Amongst the spares were also a collection of four bare pans and bodies. The first is a commercial ZN 5cc car that appears to have suffered a terminal stress crack through both pan and body, which attempts have been made to plate and even weld. 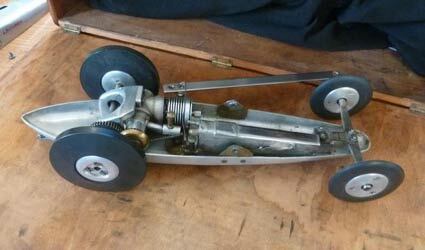 It has also been somewhat modified around the area of the front axle. 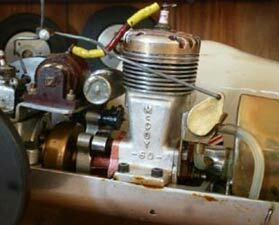 The second is another Ian Moore 5cc pan and body, seemingly sound, but with no other components evident. The remaining two are something of a mystery as they appear to be much slimmer and more streamlined 5cc cars, again hand beaten and for spur mounted motors. But again just empty shells. Were they experiments that didn’t work’, ideas for the future that never came to fruition or items that he had ‘acquired’? 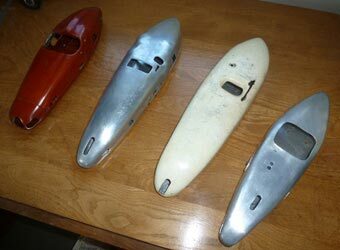 It appears that Les must have been something of an artist with a mallet, sandbag and planishing hammer if he did produce all these body shells. 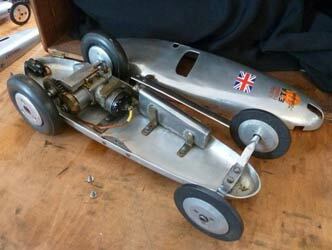 The spare body for one of the 10cc cars is a superb piece of carving and shaping and is still on its painting jig, a sad reminder of the decline of tethered car racing at the end of the 1950s. 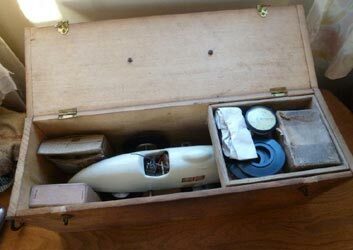 As well as a fitted travelling box for one of the 10cc cars, there is also a traditional ‘pitbox’ with a drop-down front, shelves for two cars and a drawer for spares, tyres and tools. Clipped in under the shelf is a cunningly constructed, telescopic, push stick. 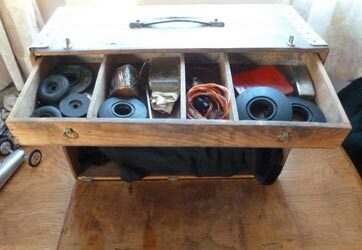 Another box contains a 10cc Hornet motor with a magneto, which may well have seen service in a car at some stage, but had been superseded by the Doolings several years earlier. This is the most complete collection of cars and items ever discovered from the later era of tethered car racing when competition and speed had become the watchwords. They also represent the last ‘knockings’ of British competition abroad until David Giles became involved in the 1970s, but by then, it was an entirely different sport. We are indebted to Fred Crammond for supplying us with an incredible selection of photos and background information relating to Les and his family.